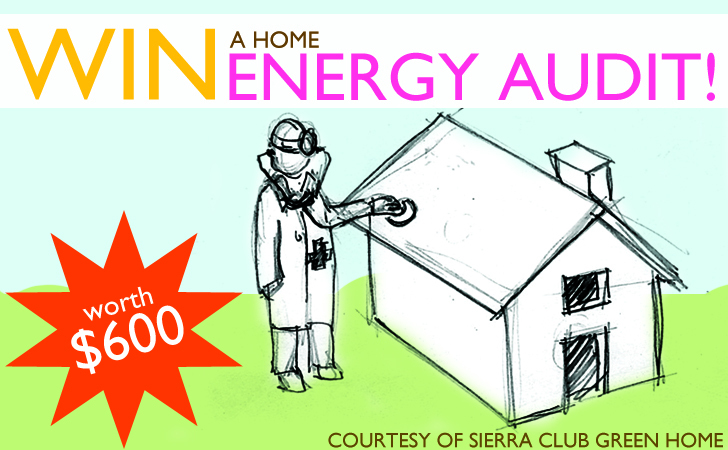 Win a Free $600 Value Energy Audit from Sierra Club Green Home - 25 Available! Win a Free $600 Value Energy Audit from Sierra Club Green Home – 25 Available! The weather’s getting colder – is your home ready for the winter? Soon, the wind will be blowing and the rain will be falling, and we’ll all be seeing a major spike on our monthly energy bills. Wouldn’t it be nice if you could save some money on your monthly energy bill to use on something else? (holiday shopping?) If the answer is yes, you’re in luck because Sierra Club Green Home is giving away 25 free Home Energy Assessments ($600 value) that could help you shore up your home and save you hundreds of dollars on your electricity costs this year. This valuable giveaway couldn’t have come at a better time because October is National Energy Awareness Month and what better way to learn how to save energy than by having a professional come to your house for free and show you exactly what to do. This in-depth 7-point energy audit will help you discover leaks, drafts and missing insulation in your home with a blower door test, use of an infrared camera to identify leaks, a smoke gun inspection, an HVAC inspection, air and duct sealing recommendations, as well as windows and insulation tests – a package that would normally cost you $600. And since we’re nearing the end of the year, many of the government incentives (translation: big tax breaks for you) for energy efficiency improvements will be expiring soon so if you’re interested in cashing in on what is essentially free money from Uncle Sam, enter SCGH’s Energy Audit giveaway today! What state is this for? Or is it nationwide? The weather's getting colder - is your home ready for the winter? Soon, the wind will be blowing and the rain will be falling, and we'll all be seeing a major spike on our monthly energy bills. Wouldn't it be nice if you could save some money on your monthly energy bill to use on something else? (holiday shopping?) If the answer is yes, you're in luck because Sierra Club Green Home is giving away 25 free Home Energy Assessments ($600 value) that could help you shore up your home and save you hundreds of dollars on your electricity costs this year.